This is a collection of the best portfolio and photography WordPress themes for photo gallery, portfolio, and photo blog websites. WordPress is the perfect platform for building a photography website, portfolio site, photo gallery website or photography blog. WordPress is free and open source and there are heaps of fantastic plugins and themes available to help you build a functional and professional looking website. While not listed in any particular order the premium themes below are the best themes available for building a photo gallery, portfolio, photography showcase and other similar websites with WordPress. This is a dynamic gallery that’s continually updated with new themes as they’re released by quality theme shops and developers. It is part of the Best Premium WordPress Themes Collection. 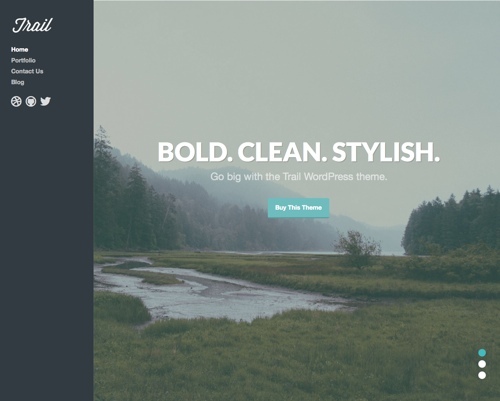 Lense is a photography WordPress theme specifically built for photographers. The premium theme from CSSIgniter comes with lots of different gallery layouts so you can display your images the way you want. Choose from scrollers, slideshows, tiled galleries, two, three or four column masonry layouts and assign amazing loading effects. You can have different settings for each gallery. The theme also comes with lots of other appearance control settings – color, typography etc so you can easily built a professional custom photography website. Eclipse is a photography and blog WordPress theme from WPZOOM. The premium theme has a simple yet very functional design that lets you make a great impact with a minimalist look that lets your content shine. Its perfect for photographers to showcase their photos and also blog. Some of the key features include: live customizer with lots of customization options (customize colors, fonts, background, logo, menu, widgets and more), widgetized homepage with multiple template options, gallery and portfolio templates, multiple post layouts, WooCommerce integration, full width Instagram widget, and more. 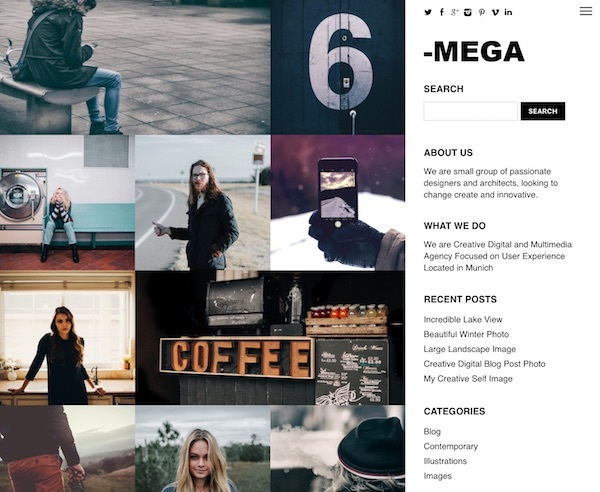 Mega is a responsive WordPress theme from Dessign with a clean, stylish and minimalist layout perfect for photography and agency websites. It has theme options, custom colors, Google fonts, sidebar widgets, and more. Expedition is a beautiful photography WordPress theme from Imagely with a simple and modern design. The premium theme has a full screen slideshow for the homepage and a transparent left side navigation menu for linking to all your photography galleries and other pages. Its mobile friendly with a responsive design, has numerous blog, post and page layouts, and fully supports the NextGEN image gallery plugin. Expedition is a child theme for the Genesis Framework so you also get all the other features and benefits of building with that top notch framework (required and sold separately). Composition is a multipurpose WordPress theme from Graph Paper Press designed with maximum flexibility in mind for building any kind of website. The theme has all the right ingredients, features and options for building a blog, business site, online store, portfolio, blog or anything else. There are over 100 features packed into the theme so you can easily create what you want. Features include: a customizable homepage, mega menus, header slideshow, theme customizer options, unlimited galleries and masonry layouts, call to action, build custom page layouts, showcase clients and services, sell products, automatic updates, custom logo, footer widgets and much more. 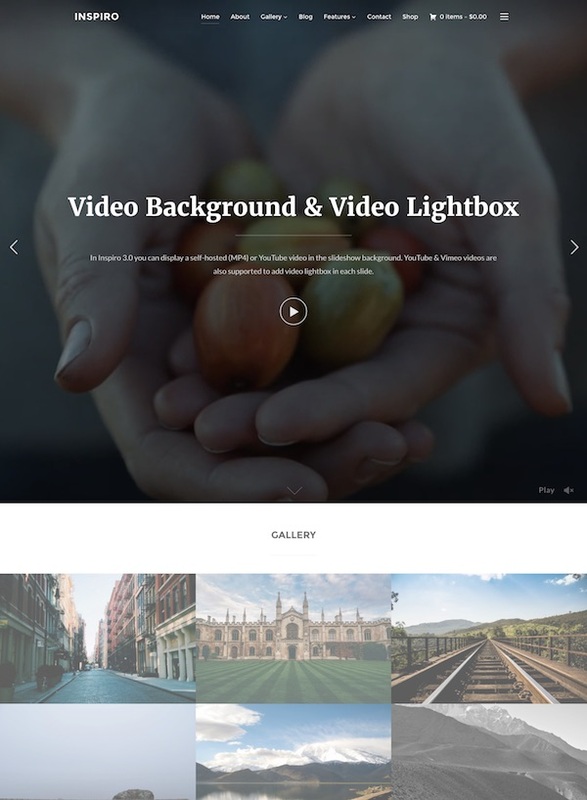 Inspiro is a beautiful photography and video focused WordPress theme from WPZOOM. 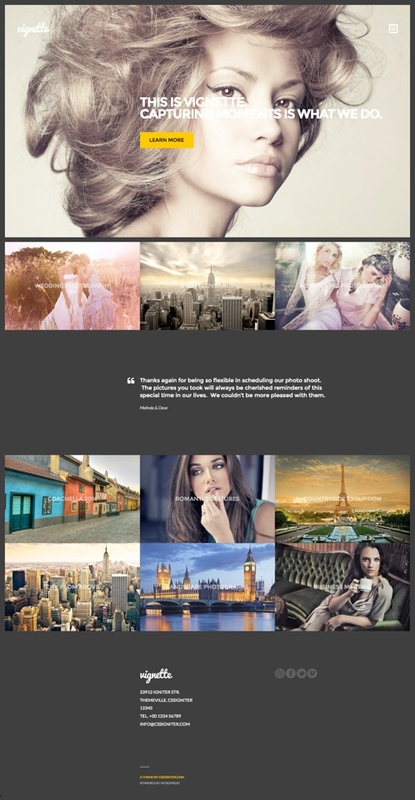 The premium theme has a modern and stylish design perfect for showcasing your images and video. It’s packed with handy features such as a fullscreen slideshow, gallery module, widgetized homepage, mobile responsive layout, WooCommerce support and more. 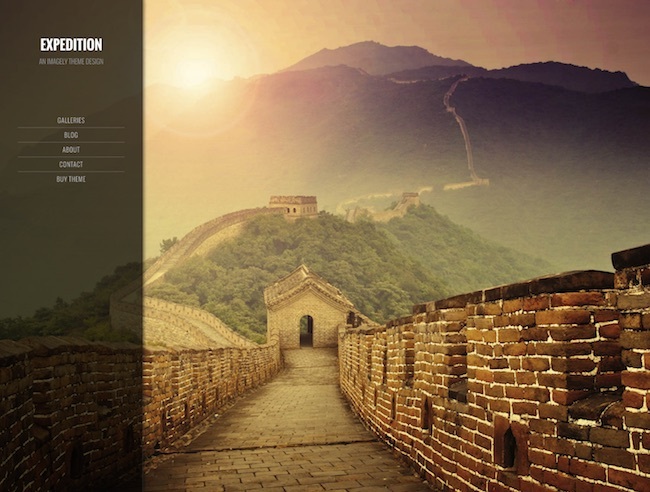 Eclecticon is a portfolio WordPress theme for photographers. 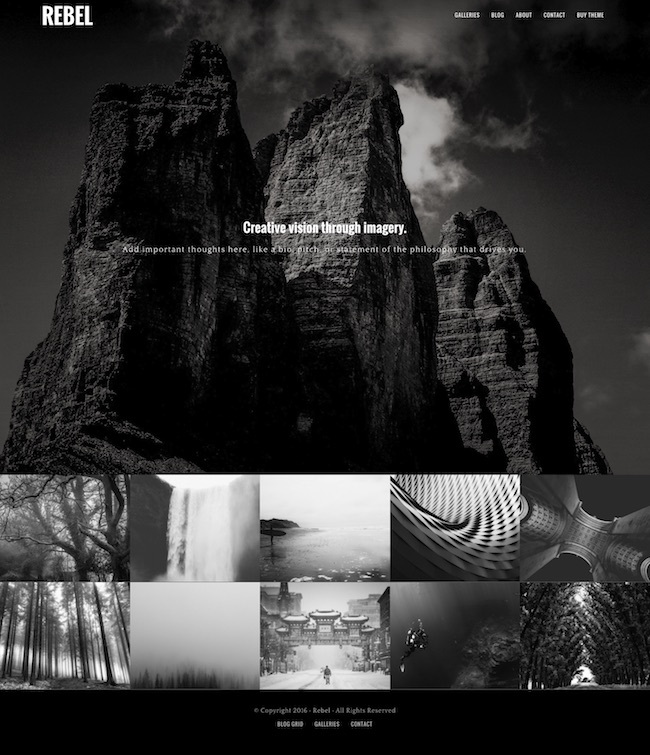 The premium theme from CSSIgniter allows you to build a beautiful minimalist online portfolio of your photographs or work. It has a huge front page slider to feature your work and make a great first impression, a custom built project post type to display your photos and videos in an efficient and beautiful way, WordPress customizer (60+ options), infinite color combinations, mobile responsive design, and more. 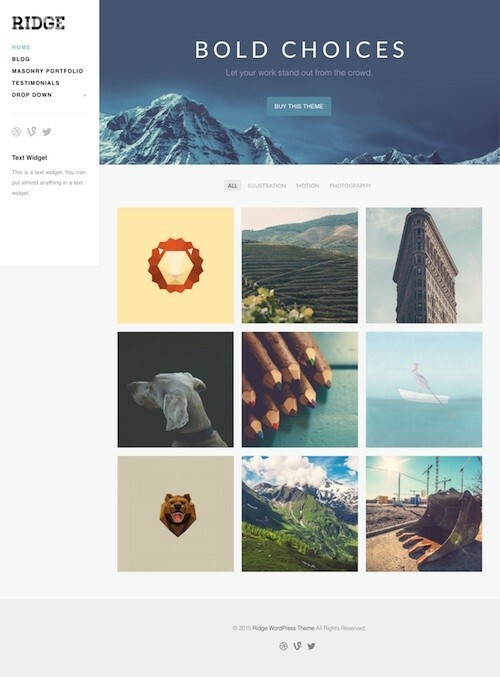 Ridge is a great looking versatile portfolio WordPress theme from Theme Trust. The professional theme has a very clean and modern design that puts your work front and center and stand out from the crowd. It’s ideal for photographers and creative professionals wanting to showcase their portfolio of work. You can use it to display images, video and even audio. Some of the other key features of the Ridge theme include: a mobile friendly responsive layout, parallax homepage banner, theme customizer (to easily change aspects of the design), filterable portfolio (smooth animated filtering for the portfolio in masonry or grid layout), custom widgets, shortcodes (slideshows, buttons, toggles, tabs, columns etc via a plugin), localization support, logo upload, video support, Google web fonts, custom page templates and more. Slush is a portfolio WordPress theme for professionals, bloggers and freelancers. It’s a child theme for the Genesis Framework. The premium theme from ZigZagPress has a clean, elegant and mobile responsive design that will ensure your content really stands out. It comes with handy theme options for full control of the themes features, mobile responsive, SEO optimized, extra templates and shortcodes and all the other features and benefits of the powerful and rock solid Genesis theme itself. 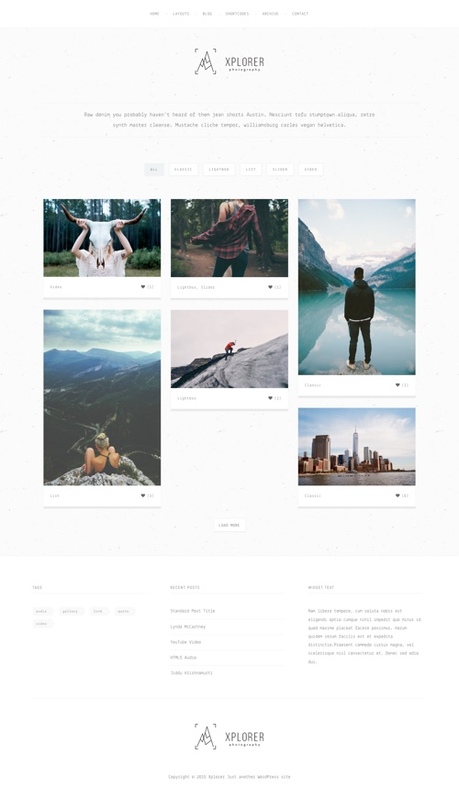 Peak is a portfolio WordPress theme for LayersWP. 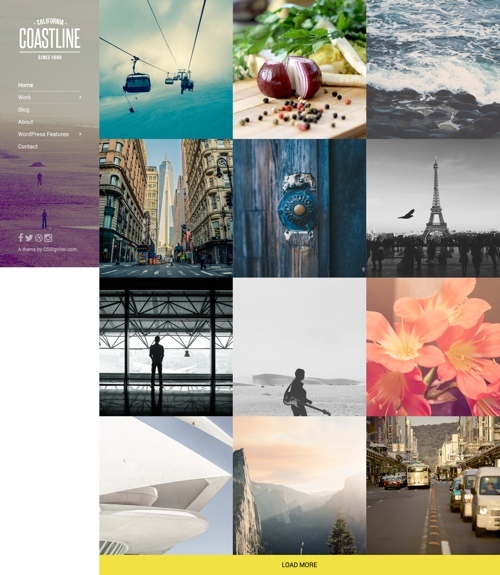 The premium theme has a striking and flexible design that’s created for designers, photographers, and other talented people to showcase their photos, creations, products or anything else you like. Being a theme for Layers you have heaps of features and customization options. Some of the key features of the Peak theme include: multiple page layouts, a useful “projects” widget, unlimited color options, 4 homepage options and a number of other pre-set layouts, WooCommerce ready, Google fonts, responsive slider, built-in customizer, translatable and more. 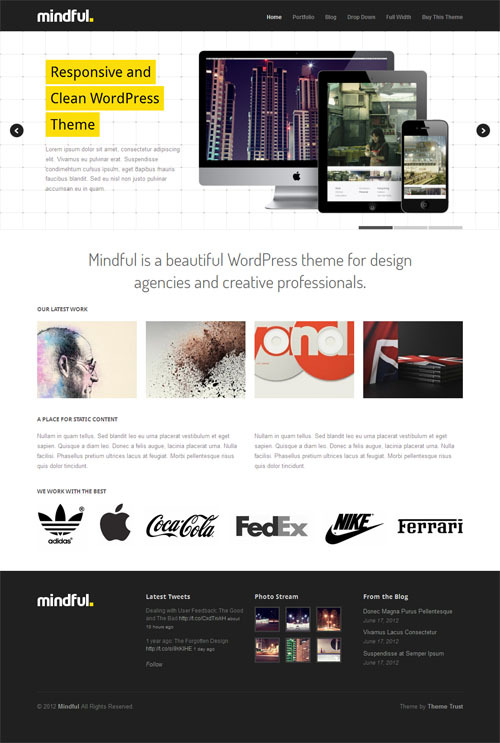 myPortfolio is a stylish portfolio WordPress theme from MyThemeShop. The premium theme has a beautiful and mobile responsive design with highly customizable layouts and lots of options. 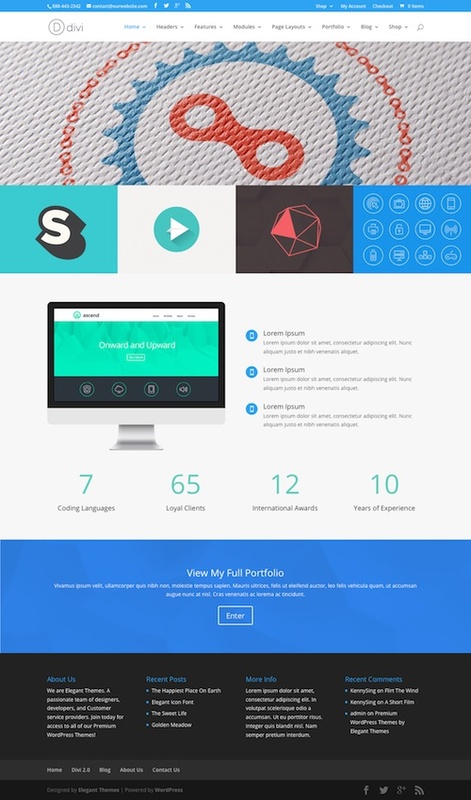 Some of the key features and benefits include: a unique grid portfolio homepage layout, portfolio post type, beautiful single portfolio page, layout options, advanced font options, ad management options and more. 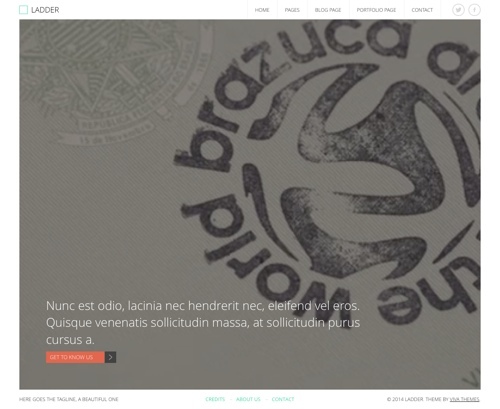 Slider Pro is a horizontally scrolling WordPress theme from Graph Paper Press. The premium theme is ideal for photographers and artists wanting to showcase their work in a beautifully minimal horizontal layout. The theme allows you to display horizontal galleries with the images aligned side-by-side running from left to right across the page. The theme doesn’t limit you to only a horizontal gallery layout however. 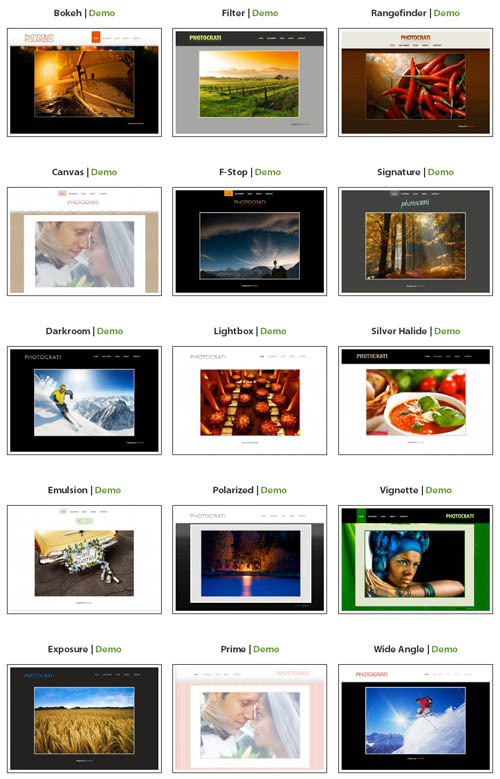 It also has other gallery layouts including: thumbnail / masonry grid, tiled mosaic galleries or a slider. Ansel is a WordPress photography theme from Imagely with a beautiful design, pixel perfect styling and a wide open landscape feel. 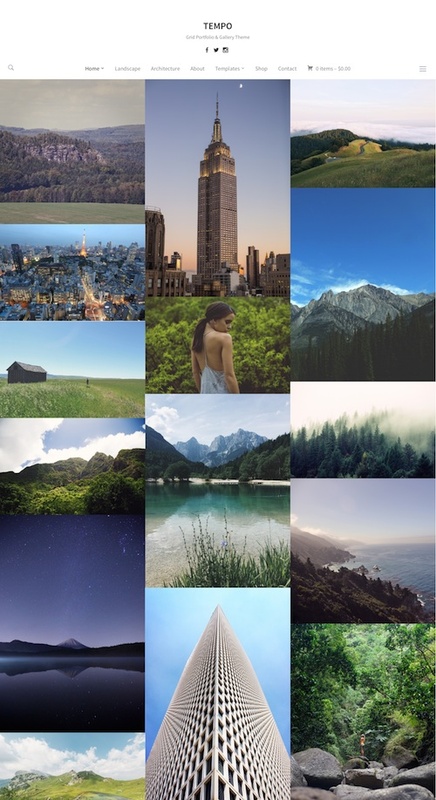 The premium theme would be ideal for landscape and outdoor photographers. Of course it would be perfect for any other type of photography website as well. Its mobile friendly with a responsive design and has a full screen homepage slideshow, multiple blog layouts, page and post templates, and full support for the NextGEN gallery plugin (lots of gallery options plus option ecommerce functionality to sell prints and photos). Ansel is a Genesis Framework child theme so you get all the other features and benefits of building with that top notch WordPress framework (required and sold separately). Formo is a flexible multipurpose child theme for the Genesis Framework. The premium theme is from ZigZagPress and has a modern and minimalist design that’s easy to customize. Formo is also ecommerce ready with WooCommerce support built in so could be used for any type of website – a portfolio, ecommerce shop, professional blog or anything else. Some of the key features and benefits of the theme include: a mobile friendly responsive design, theme options, extra page templates, slide out side menu, WooCommerce support for ecommerce, portfolio, blog section, shortcodes, localisation ready, and more. Being a child theme for the Genesis framework you also benefit from all the other great features and functionality it provides such as: clean code, mobile friendly design, fast page load times, rock solid security, and one click updates and more. 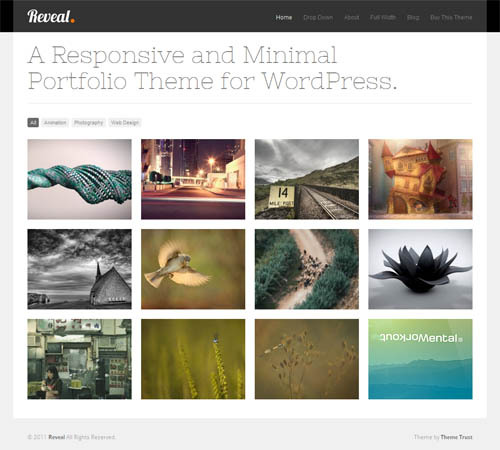 Regain is a minimalist portfolio and blog WordPress theme from Northeme. 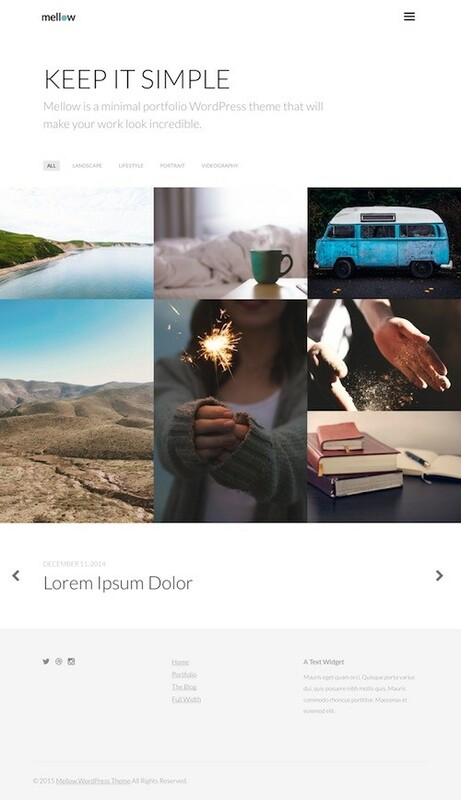 The premium theme would be ideal for creative professionals, writers and others and allows you to showcase your works and share your stories with adjustable project composition, unique layouts and long form story posts. Some of the key features include: built in slider and lightbox, adjustable portfolio composition (composition panel allows to add image, video, slider and text elements and arrange their alignment and ordering as you wish), featured image / video options, full ajax navigation, Google fonts, unique portfolio and blog layouts, portfolio filtering options, skin and color options and much more. 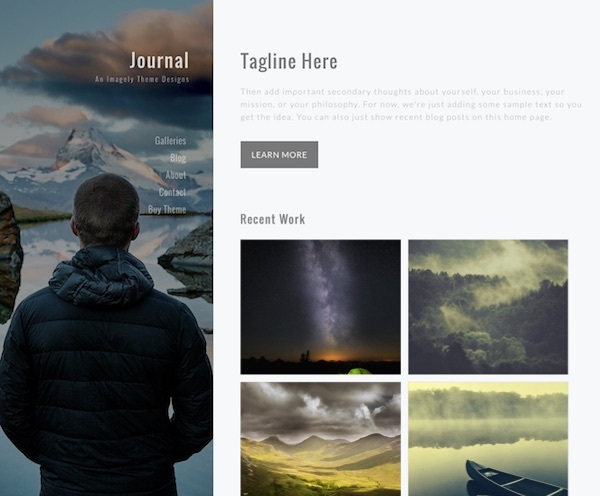 Journal is a beautiful photography WordPress theme with a simple and functional design for displaying your photographs. The premium theme from Imagely is child theme for the Genesis Framework and is ideal for photo blogging, a life journal or any other type of portfolio site. It has a fixed left side navigation menu with background image for links to your galleries, blog and other pages. It comes with various portfolio layout options (mosaic, thumbnail, filmstrip list, grid etc), multiple blog and post templates, mobile responsive design and more. Vector is a responsive portfolio WordPress theme ideal for design agency business and portfolio websites. The premium theme from DESSIGN has a simple and minimalist design and a full screen scroll motion slider for the homepage. Some of the key features include: theme options, full responsive slider, valid XHTML and CSS, search engine optimized, unlimited domain usage and more. Rich Gallery is a modern and minimalist gallery WordPress theme ideal for photographers, artists, designers and others wanting to showcase their portfolio of photos, video or design work. The premium theme from RichWP has a fully adaptive and mobile responsive design that’s minimal but bold and visually stunning to ensure your photos really stand out. Some of the key features include: the ability to build galleries from posts or pages, support for native WordPress post formats, WooCommerce ready for ecommerce, professional looking blog, great looking gallery and post list layouts, easy color customization, logo integration, multiple widget areas, icon menu, translation ready, quality code to WordPress standards, supports most Jetpack plugin features (like tiled galleries, contact forms, and so on), comment rules and more. 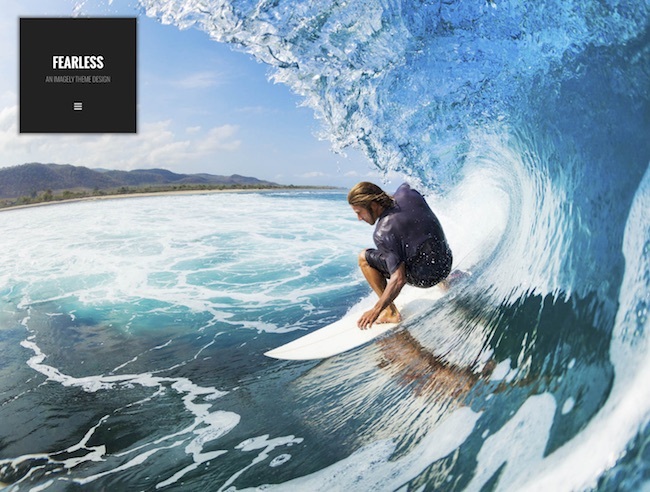 Fearless is a simple and beautiful photography WordPress theme with a modern and mobile friendly responsive design. The premium theme from Imagely has a nice full screen slideshow homepage with a collapsible floating menu to bring full attention to your photographs and text content. 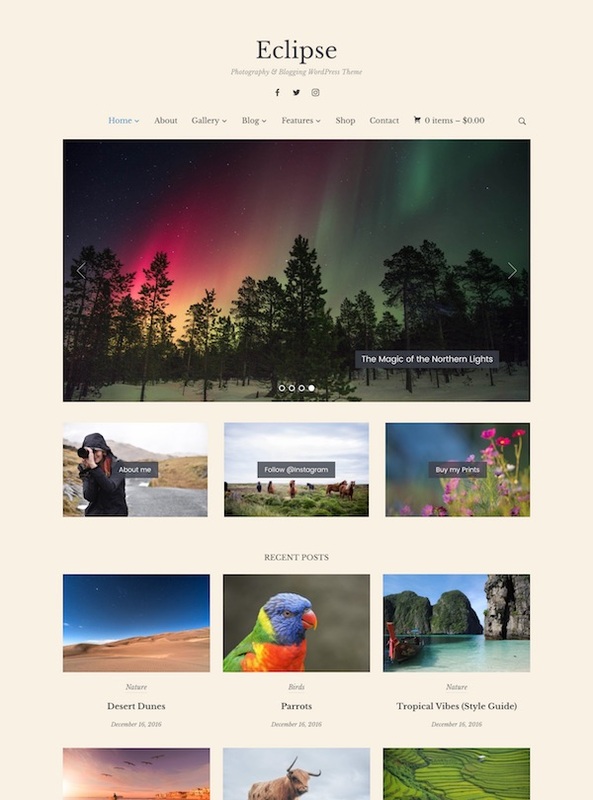 It fully supports the NextGen gallery plugin for lots of different photo gallery styles and options and comes with various custom blog layouts and post / page template styles. The Fearless theme is a child theme for the Genesis Framework so you also get all the other features and benefits of building with that top notch framework (required and sold separately). Split is a beautiful and unique multipurpose WordPress theme with split scrolling functionality. It allows you to create a cool splitting effect, with one section sliding up and the other down, as you scroll from one row to the next for a visually appealing and unique viewing experience. The split-scrolling feature allows you to display any type of content (full-width video, image, text etc), on any row of your site. The premium theme from Themify could be used for any type of website indulging: agency site, restaurant, product website, portfolio, personal website, ecommerce shop, wedding website, video site or anything else. Madrigal is a minimal and mobile responsive portfolio and blog WordPress theme for creative. The premium theme from NORTHEME allows you to build simple yet bold websites with custom page covers, smooth transition effects, custom color schemes and minimalistic interface features. Some of the key features of the theme include: full page covers for pages, categories and posts (each cover can have its own background color / image, text color, title and caption), custom page colors and skins, portfolio and custom post types, complex AJAX navigation, grid layout manager (create / manage custom layouts, 2 to 6 columns, adjust padding etc), custom page templates, featured image / video options, built-in slider, gallery and lightbox, Google fonts, and more. 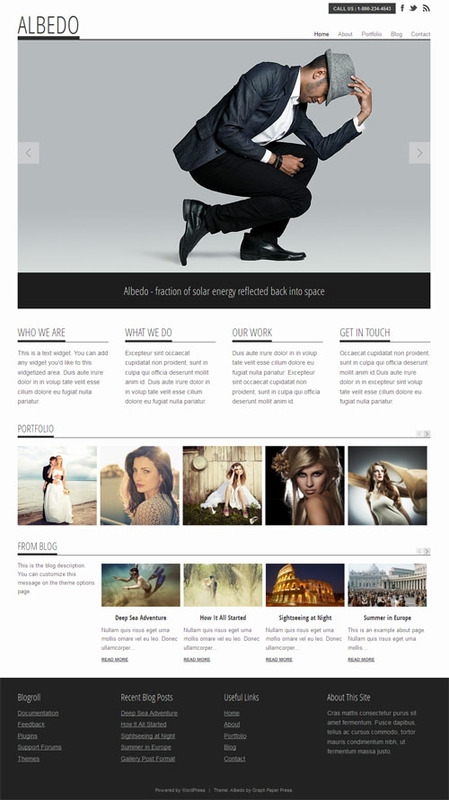 Blush is a WordPress photography theme from Imagely designed with wedding photographers in mind. The premium theme has a professional, pixel perfect design with a classic wedding photography website look and a feminine finish. Some of the key features include: a mobile friendly responsive design, complete homepage slideshow, multiple blog, post and page templates, full NextGen gallery plugin support and more. Blush is a child theme for the Genesis Framework (required and sold separately) so you also get all the other features and benefits of building with that excellent framework. 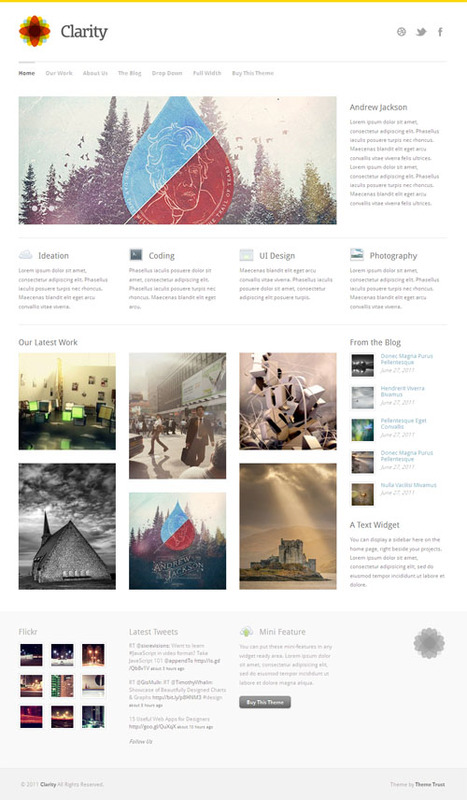 Reportage is a photography WordPress theme with a beautiful and modern approach to photography websites. 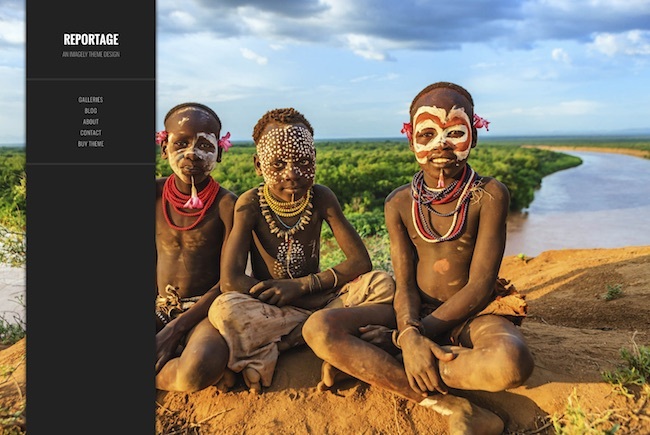 The premium theme from Imagely has a full screen slideshow on the homepage and a narrow floating left side menu to bring full attention to your photos and content. The theme is fully mobile friendly with a responsive design, has full support for the NextGEN plugin for lots of galleries and ecommerce functionality, multiple blog and post layout options and more. Reportage is a child theme for the rock solid, secure and search optimized Genesis Framework (required and sold separately). Mellow is a clean and attractive responsive portfolio WordPress theme from Theme Trust. 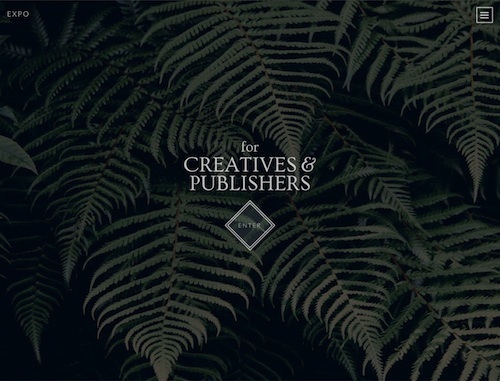 The premium theme would be ideal for creative professionals, photographers and others wanting to showcase their work, photographs, videos or other content in a unique and minimalist website. Some of the key features of the Mellow theme include: filterable masonry or grid portfolio layouts, smooth hamburger slide out menu which you can set a custom background, mobile responsive layout, theme customizer support for customization, custom page templates, localization support, logo upload, video support, Google web fonts, custom widgets, shortcodes (slideshows, buttons, toggles, tabs, and columns with a free plugin), and more. A responsive portfolio WordPress theme from ThemeTrust with a super clean, minimalist design. The premium theme is perfect for creative individuals and companies to showcase their work and highlight their products. Features include a large full width homepage banner to display a key message, filterable portfolio template, TouchSwipe slideshow, custom options panel, mobile responsive design and more. 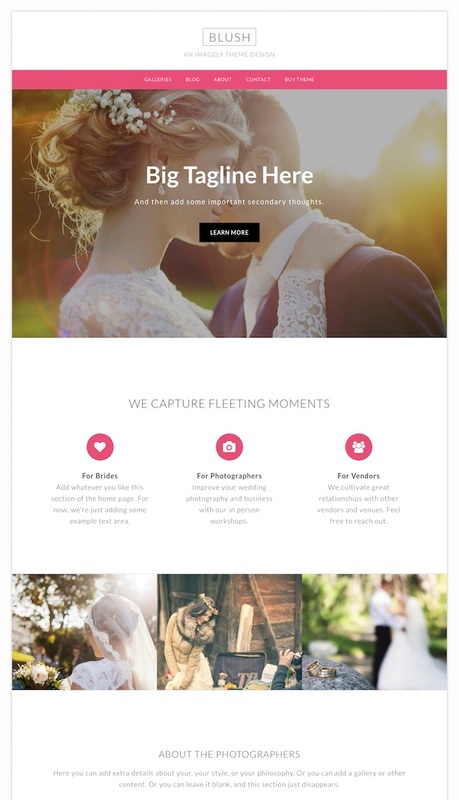 Free Spirit is a photography WordPress theme designed for wedding photographers. The premium theme has an open, calm and inviting design. The homepage features a prominent intro text section and background image slideshow, along with sections for text content and photo gallery links. Its mobile friendly with a fully responsive design and comes with multiple blog, post and page layout options. Free Spirit is also a child theme for the Genesis Framework so you also get all the features and benefits of building with the rock solid, secure and search optimized Genesis Framework (required and sold separately). Xplorer is a modern and minimalist portfolio WordPress theme for creative professionals, freelancers and bloggers. The premium theme from ZigZagPress is a child theme for the rock solid, secure and search optimized Genesis Framework. It has two homepage layout options (blog or portfolio), a mobile friendly responsive design, theme options, shortcodes, various post layouts, localization ready and more. Cre8or is a beautiful and unique portfolio WordPress theme from Tesla Themes. The premium theme has a clean and minimal design with great attention to detail so you can showcase your latest projects or work in style. It would be ideal for an agency or studio, personal blog, video sites, project websites or anything else. It features a mobile responsive layout, 5 different single portfolio item layouts, neat animations, fancy image and video lightbox, easy customization options and more. Expo is a unique and stylish WordPress theme for creatives, photographers, publishers and businesses. 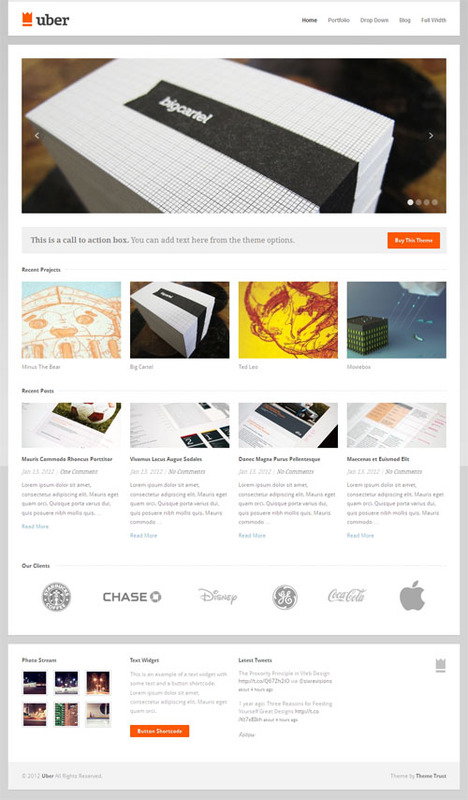 The premium theme from Graph Paper Press has a splash page homepage layout and horizontal side scrolling effects. The splash screen homepage lets you show a custom header image, site description and button to clearly communicate your message. Once you enter the site you navigate between posts using horizontal scrolling on the home and archive pages. Some of the other key features of the theme include: full width photos, custom headers (header images span the full width of the browser), fully responsive design (optimized for iPhone, iPad and all other mobile devices), ecommerce ready with Sell Media plugin integration (so you can sell and license photos and sell prints online with ease), easy customization (change background and header images, add a logo, favicon, tweak colours, create custom menus, pick custom fonts and add widgets), hundreds of fonts, JetPack integration (add carousels, contact forms, likes, social sharing, subscriptions, galleries and more), Infinite scrolling, custom widgets and widget areas, translation ready, custom side-out mobile type menu, theme options, clean code and more. 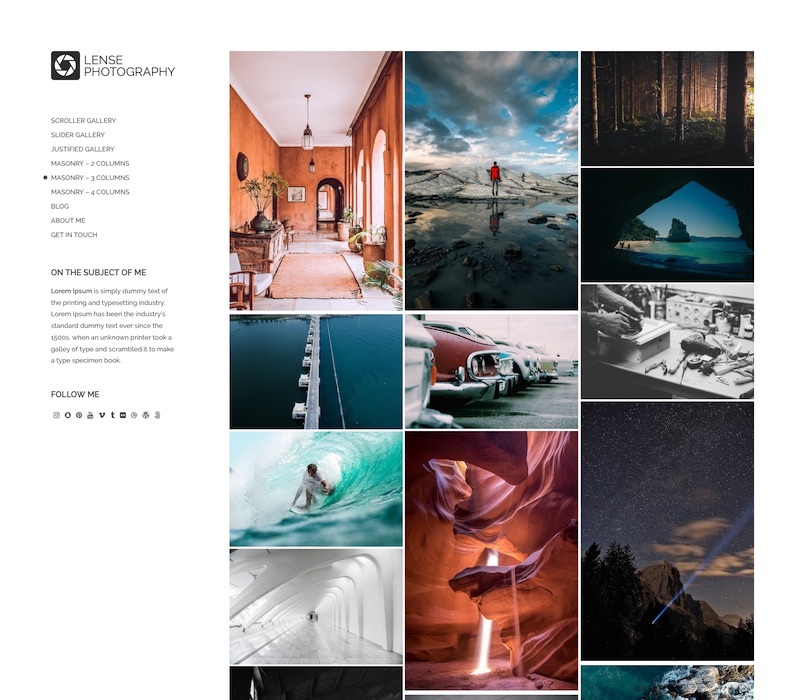 Coastline is an elegant portfolio and photography WordPress theme for creative professionals. The premium theme from cssigniter has an attractive and mobile responsive design that allows you to showcase your work in a unique and professional manner. Some of the key features of the theme include: full support for the JetPack plugin (for things like infinite scroll, galleries, sharing, stats and much more), post formats, a fixed left sidebar and menu, shortocdes, theme options, localisation options, various colour variations and more. 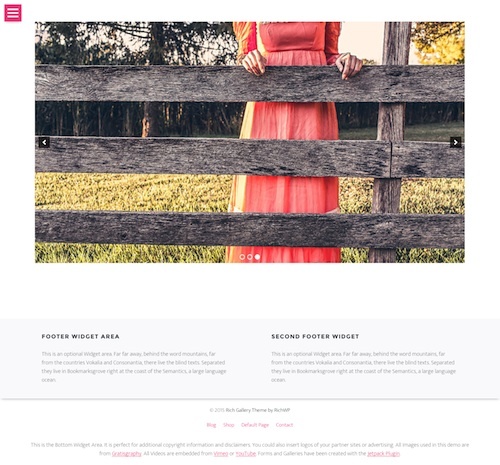 Rebel is a modern and stylish photography WordPress theme from Imagely. 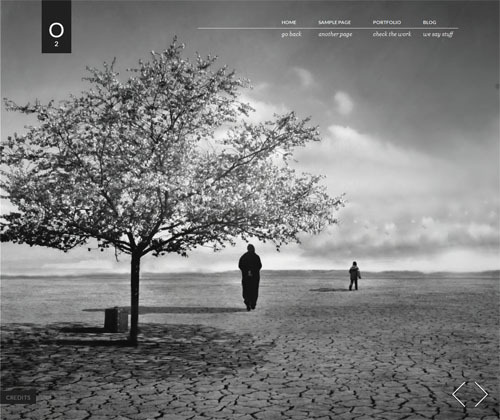 The premium theme has monochromatic tones that will bring full attention your black and white and color photographs. The homepage has a full screen slideshow and intro text for maximum impact on visitors. Other features of the theme include: a mobile friendly responsive design, full support for the NextGen gallery plugin for lots of different gallery styles, and multiple blog and post / page layouts. Rebel is a child theme for the rock solid, secure and search optimized Genesis Framework (required and sold separately). Exposure is a feature rich, customizable and mobile friendly photography business WordPress theme for professional photographers, freelance photographers or armature photographers alike. The premium theme from Theme Fuse has a modern and professional design ideal for photography business websites and is packed full of cool features. Some of the key features of the theme include: a visual builder (drag & drop page builder and shortcodes to create unique, complex pages), styling options (simple color pickers so you can easily change colours and backgrounds with a single click), portfolio templates with portrait and landscape views, multiple slider options with video support, events calendar, Google fonts integration, mega menu, responsive and retina ready, built on Unyson Framework (with lots of useful control settings and customization options), multi-language options and more. 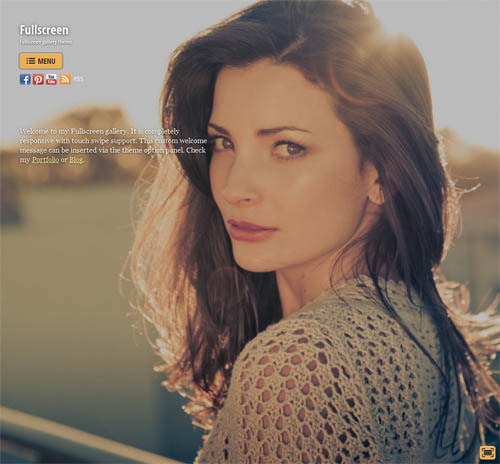 Tempo is a beautiful photography and portfolio WordPress theme from WPZOOM. 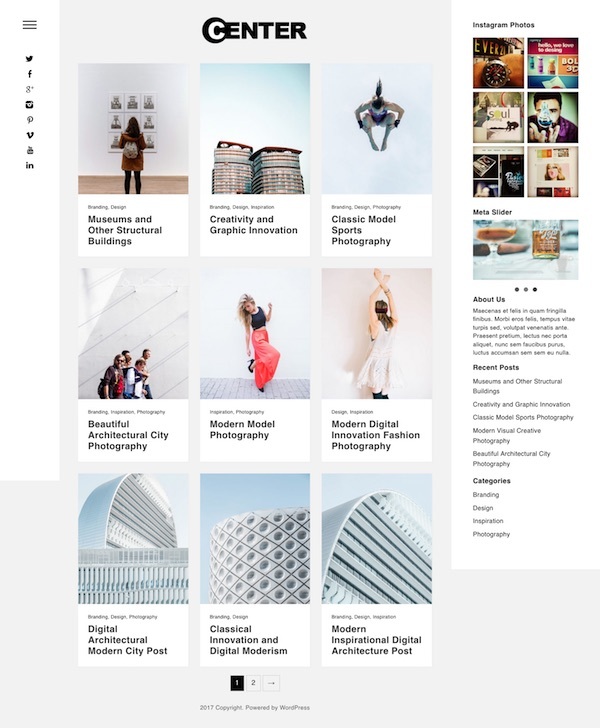 The premium theme has a great minimal design perfect for photographers, artists, designers and others to showcase their photos or portfolio of work online. It also has heaps of useful features and functionality to easily create a unique and functional photography portfolio websites. Some of the key features include: a mobile friendly responsive design, masonry or grid layouts, 2 color skins (light or dark), multiple header layouts (logo centred, left or right aligned), multiple thumbnail aspect ratios (landscape (4:3), portrait (3:4), and square (1:1), or original with no cropping), WordPress customizer support (for easily customization of the colors, fonts, background, logo, menu, widgets and many others), full screen images in posts (to create distraction-free galleries using large images), WooCommerce ready, infinite scroll, Jetpack support, easy translation support and more. F22 is a multi-purpose mobile friendly photography portfolio WordPress theme from Graph Paper Press. The premium theme has a modern, simple and minimalist design ideal for showcasing your work and ensures your images take centre stage. F22 allows to show off your portfolio, sell your photography or artwork, and run a blog all in the one place. The custom homepage allows you to display a welcome message with information about yourself along with image links to your latest photo galleries. It has a 2 column grid design allowing you to showcase portrait and landscape images without cropping. You can mix and match various layouts and alignments in the portfolio galleries and bring your photos to life by telling a story about each one. Photos are full size and you don’t need to crop or resize. Some of the other key features of the theme include: easy customization options (to easily tweak the design and change the colors, fonts etc), ecommerce ready with ability to sell photos, prints and downloads (integrates with the free Sell Media plugin and all of it’s extensions so you can sell and license photos and sell prints online), lots of fonts, custom colors, custom widgets, infinite scroll, JetPack integration (add carousels, contact forms, likes, social sharing, subscriptions, galleries etc), translation ready, custom backgrounds, custom menus, and more. 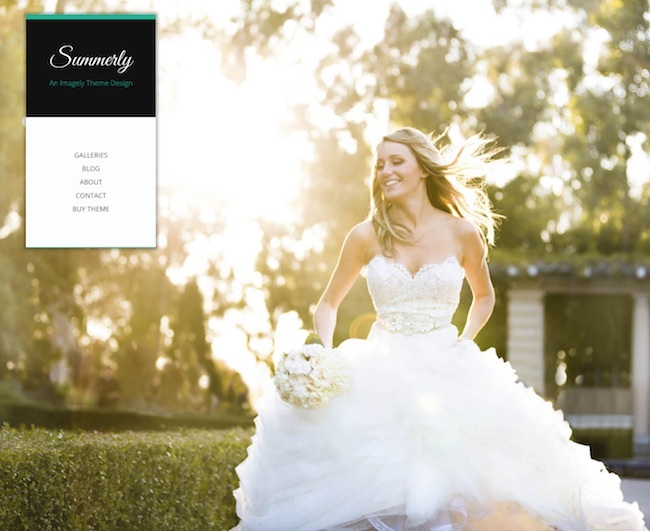 Summerly is a beautiful wedding photography website WordPress theme from Imaegly. The premium theme has been designed with wedding photographers in mind but of course could be used for any type of photography website. It has a full screen slideshow homepage, left side navigation menu, a mobile friendly responsive design, full support for the NextGEN plugin for lots of different gallery types as well as ecommerce (optional), multiple post and page layouts plus more. Summerly is a child theme for the rock solid, secure and search optimized Genesis Framework (required and sold separately). 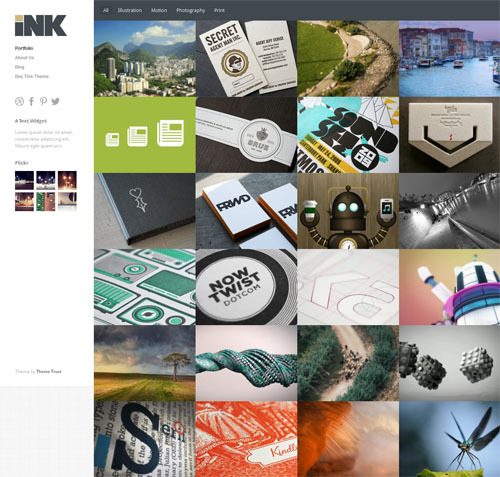 Ink Drop is a mobile responsive portfolio WordPress theme from Obox Themes. 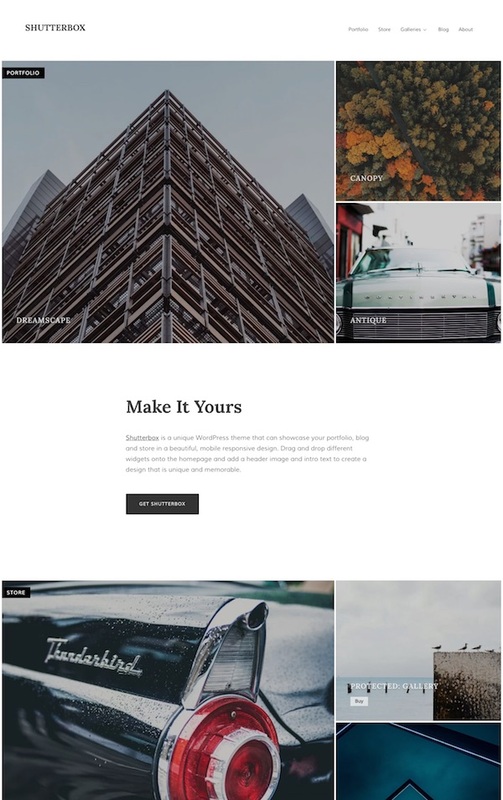 The premium theme has a modern flat and minimal design ideal for freelance designers to showcase their work or anyone else who wants to share their photos, portfolio or other content. Some of the key features of the theme include: a customisable filterable portfolio section (2,3 or 4 columns, multiple images per portfolio item, full screen header options, with or without text etc), blog section, video support with video resizing, lost of design customization options (multiple layouts and fonts, custom headers, unlimited colours etc), translation options, hidden mobile menu, custom widgets, and a mobile responsive layout so it works and looks great on any device. 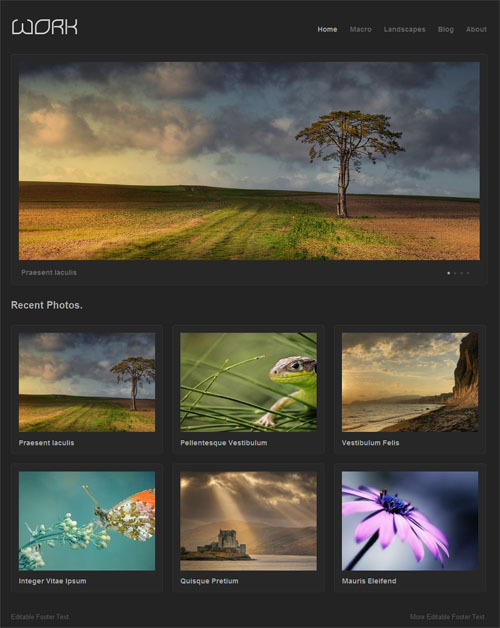 PhotoNote is a beautiful WordPress theme designed for photography and portfolio websites. The premium theme from WPZOOM has undergone a major re-design and includes many new features and improvements. It has a simple and modern design that’s ideal for showcasing your photos and blogging. Some of the key features include: a widgetized homepage, a touch-enabled slideshow on the front page that supports both landscape and portrait-oriented images, a fully responsive mobile design, masonry layouts for posts, WordPress Customizer integration for easy customization (change the logo, fonts, colours, background, widgets and more), JetPack plugin support for Lightbox Carousel or Mosaic Gallery, a sliding sidebar panel, YouTube and Vimeo video support for fullview video, light or dark skin options, automatic framework updates, theme options panel and more. 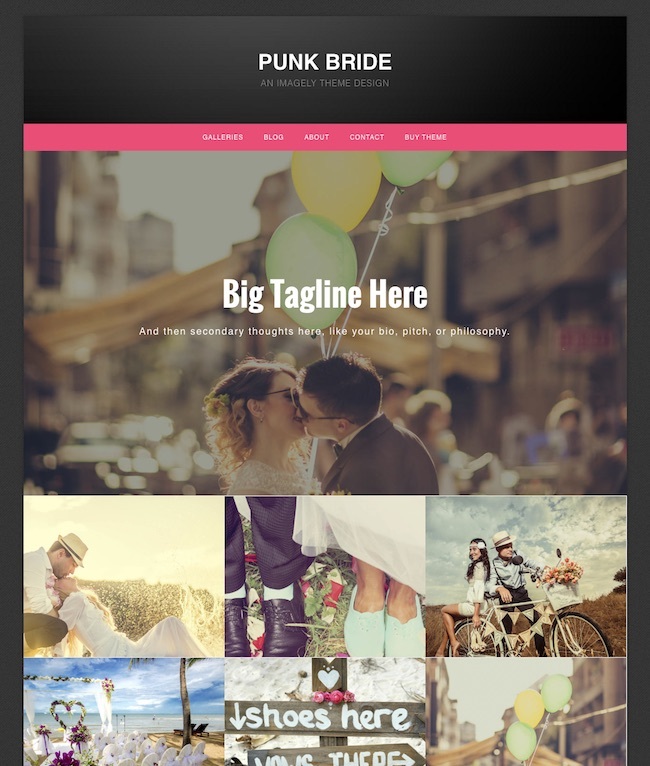 Punk bride is a photography WordPress theme ideal for a contemporary wedding photography website or any other photography website. The premium theme from Imagely takes a classic wedding photography website design and adds pops of bold color to really stand out. Its mobile friendly with a responsive, has a homepage slideshow, and comes with custom blog, post and page templates. Punk Bride is a child theme for the rock solid, secure and search optimized Genesis Framework (required and sold separately). 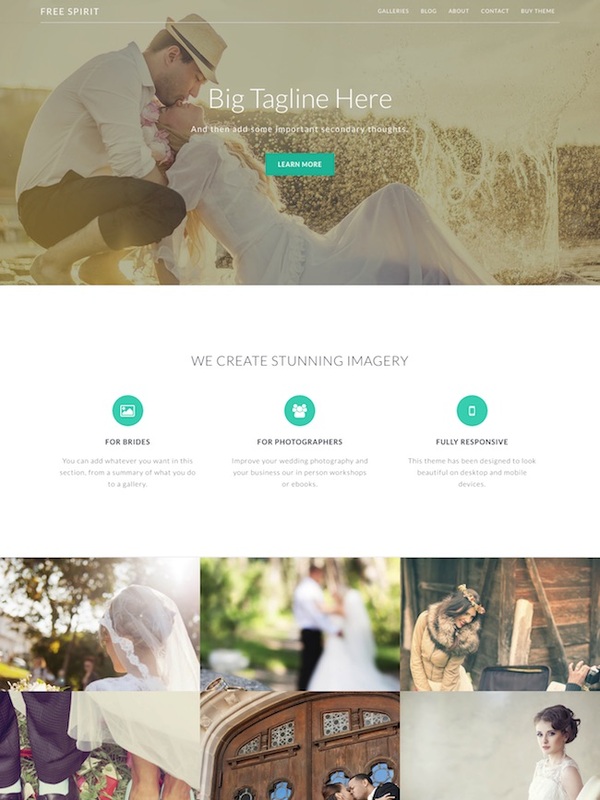 Lightly is a wedding photography WordPress theme from Imagely. The premium thme has a classic wedding photography website look with pixel perfect design and lots of great functionality. It’s a Genesis child theme so you get all the features and benefits of building with the Genesis Framework (required and sold separately). The homepage features a prominent intro text section and background image slideshow, along with sections for text content and photo gallery links. Lightly is also mobile friendly with responsive design. 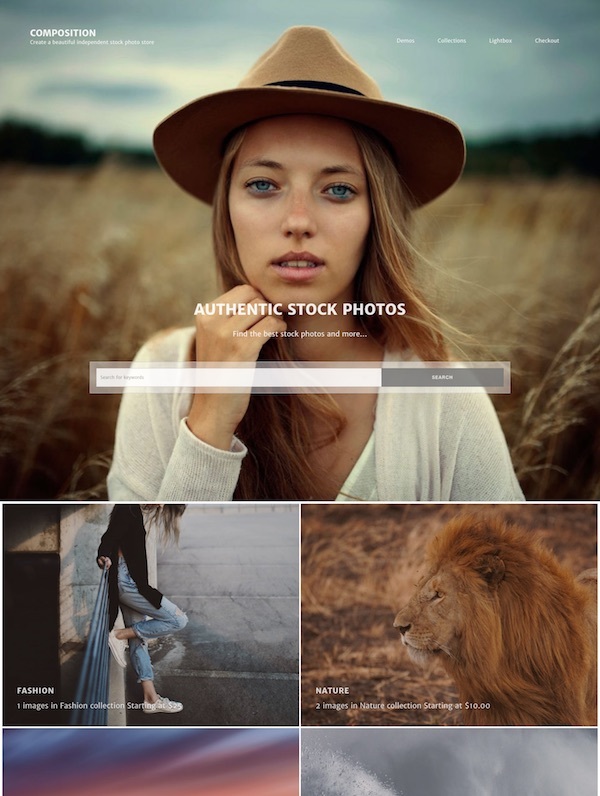 Lookbook is a beautiful mosaic styled photography portfolio WordPress theme from Graph Paper Press. The premium theme has a minimalist and mobile responsive design that allows that lets you showcase your best work on the homepage in an eye-catching and beautiful mosaic. The theme comes with a ‘lookbook’ feature which enables visitors to curate samples of your work through your website and create small protected PDF lookbooks showcasing your work. Visitors are required to supply and email address in order to download the lookbook. This helps visitors intimately engage with your artwork while allowing you to generate a mailing list of potential fans and clients. Some of the other key features of the theme include: a minimalist menu with icons that appear when clicked, slideshows, post formats (videos, images, galleries, audio, quotes, links, and standard posts), ecommerce integration to sell prints and digital downloads, and a responsive design. 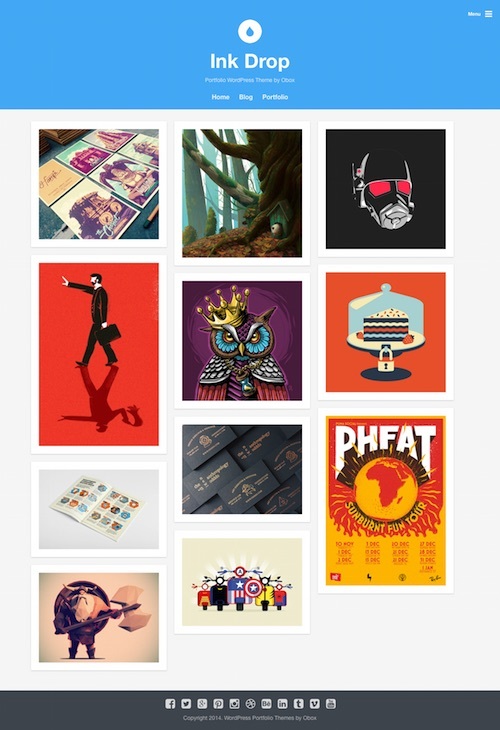 Creative is a beautiful portfolio WordPress theme from UpThemes. The premium theme has a modern and flat designed ideal for showcasing your projects and portfolio of work. Creative is powered by the FreeFolio plugin, which includes a portfolio shortcode and a variety of options to display your work. Some of the other notable features include: a fully responsive design, Dribbble importer, Typekit fonts for beautiful typography, portfolio grid with sorting filter, full width image slider, Sass and Compass powered styles, and lightweight fast and commented code. Drone is a clean and minimalist creative portfolio and blogging WordPress theme for the Genesis Framework. The premium theme from ZigZagPress has a modern and minimalist design that is 100% responsive. 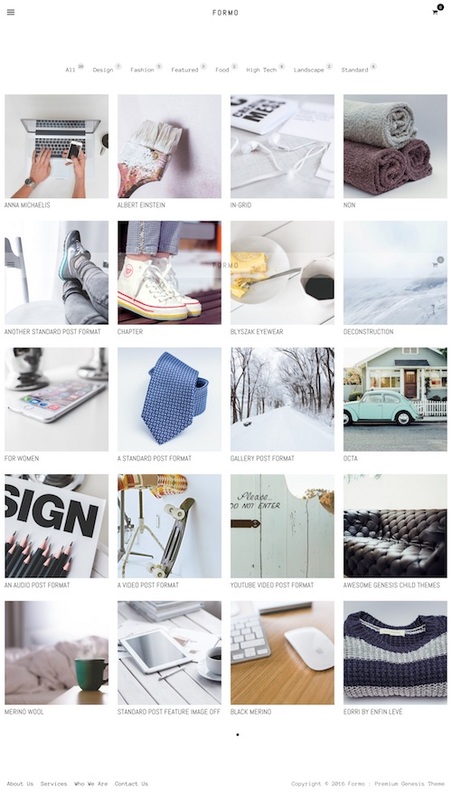 You could use the theme to showcase your products, portfolio, photographs, and blog. Some of the notable features of the Drone theme include: theme options to control features, various layout options, portfolio layouts, custom templates, localization ready, extra shortcodes, various colour options, and more. Being a child theme for the Genesis Framework it also benefits from the solid core framework and all the benefits and benefits it brings. 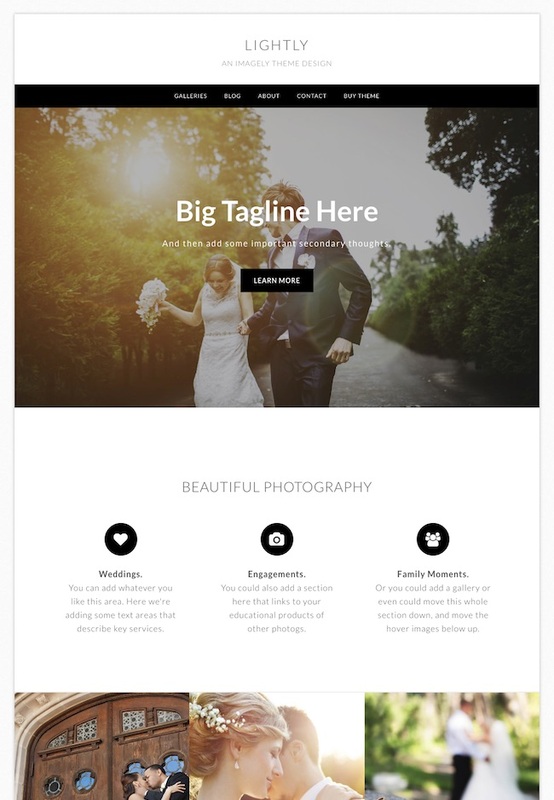 Vignette is a premium photography theme for WordPress with a responsive design. The theme from cssigniter is built for professional photographers, amateur photographers, creative, models or anyone else that ones to showcase their work in a unique and professional manner. It has a minimalist, full width layout and design that allows your images to be center stage. Some of the other key features of the theme include: use of the Jetpack plugin for galleries and carousels, seven gallery styles, two homepage options (video or images), shortcodes, HTML5 and CSS3 coding, 7 colour styles, blog section, localization support, theme options panel and more. 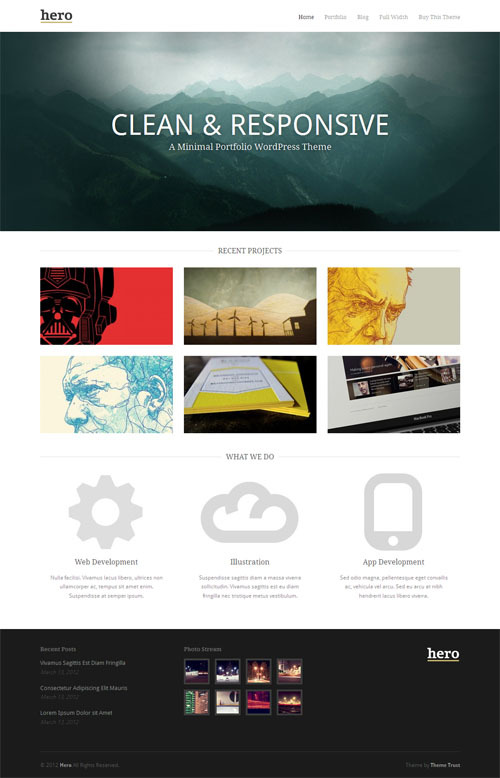 Trail is a multi-purpose portfolio WordPress theme from Theme Trust. The premium theme has a bold, clean and stylish design with a focus on big images and beautiful typography. It has a unique full screen vertically scrolling parallax home page. Some of the other key features of the theme include: a mobile responsive design, filterable portfolio, video support, theme customizer, custom widgets and page templates, shortcodes (via a free plugin), localization support and more. A responsive business portfolio WordPress theme from Theme Trust ideal for photographers, freelance designers, design firms and others. Features include a custom portfolio section with smooth filtering animations, option for a full screen background that’s synchronized with the homepage slider, custom background images for individual pages, touch swipe sideshow, Google fonts, custom options panel and more. Modern Portfolio is a beautifully minimal, responsive portfolio WordPress theme for the Genesis Framework from StudioPress. The premium theme has a sleek, high-contrast, flat design which is highly flexible making it ideal for photographers, artists, freelancers, designers and others to showcase their work in a modern website design that focuses attention squarely on your images. Some of the unique features include: streamlined black and white typography and a high contrast layout, call to action and customisable “hire me now” sections, integrated blog section to blog about your work, easy one click Google Authorship setup, a landing page templates, custom background, menus and featured images, theme options panel and more. Ink is a clean and simple responsive WordPress theme from Theme Trust which could be used for an elegant portfolio website or a stylish blog. The premium theme has a responsive design so it adapts to any screen resolution working perfectly on iPhones, iPads and all other mobile devices. You can set a full screen background image to each individual project, post, or page. This makes each page unique and really stand out with its own personality. Some of the other features include a filterable portfolio template and custom portfolio post type, TouchSwipe slideshow, Google web fonts, various custom shortcodes, the ability to set your own colours and more. Ladder is a cool multi-purpose responsive premium WordPress theme from Viva Themes. It has a professional, modern and flat design that would work well for small business and company websites, personal and creative portfolio sites. One of the main features of the theme is ability to embed a video background or an image background for every post and page of the site. On the homepage you can have a video background or slideshow. The theme has a 100% mobile responsive design and when viewed on mobile devices the video backgrounds will fall back to images. Some of the other key features of the Ladder theme include: a nice portfolio page template, integrated blog pagination, social icons, image or text logo, threaded comments, and more. Chromatic is a premium photography WordPress theme designed for showcasing your portfolio, selling your images and getting hired. Graph Paper Press set themselves the task to create the “the ultimate portfolio theme for WordPress” – resulting in the beautiful and featured packed “Chromatic” theme which is perfect for photographers. The theme has about a dozen layout options to choose from, and the portfolios can be displayed horizontal, vertical or square image layouts and you can choose between two, three or four column layouts and allow your site visitors to toggle from grid to list view. All the gallery slideshows can be toggled to fullscreen mode or thumbnail mode to show all the images at one for easy navigation. It integrates with the free Sell Media plugin and all of its extensions so you can sell and license photos and sell prints online with ease. Some of the other features include: a mobile friendly responsive design, nice parallax effects, theme options so you can easily add a logo, favicon, header image, background image, background colours etc, five alternative styles and more. Port is a beautiful responsive premium WordPress theme from Theme Trust ideal for agencies, business websites, creative portfolios and others wanting a modern and eye catching web presence. The homepage features multiple parallax sections where you can display your products and services, blog posts, testimonials, call to action or anything else you like. Some of the other key features of the theme include: a sleek slide out navigation menu, various custom widgets and page templates, a portfolio with smooth animation effects, Google web fonts, localisation support, shortcodes for slideshows, buttons, columns etc, testimonials post type, theme options panel and more. 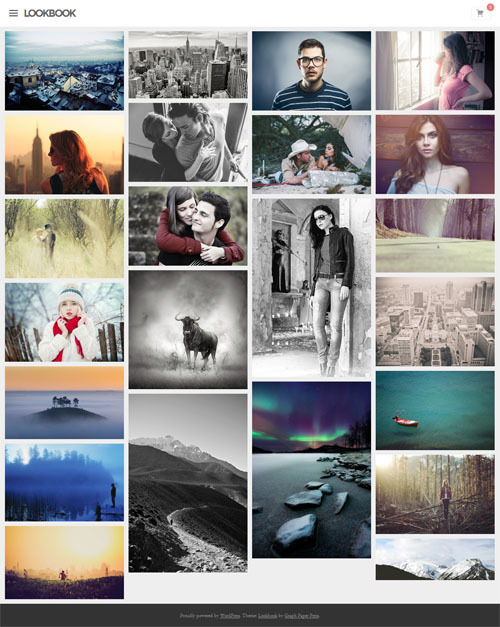 Memories is a beautiful responsive photography WordPress theme from cssigniter. The premium theme has a nice and simple dark and minimalist design that makes your photos really stand out and be the focus. It’s powered by the JetPack plugin (by the creators of WordPress) for the photo gallery and other functionality so you don’t have to worry about being locked-in to the theme. The Memories theme is also designed to be as flexible as possible and you can select how many columns you want for your photo galleries. Some of the other features include: a mobile responsive layout, blog section, custom menus, shortcodes, localization, theme options panel and more. 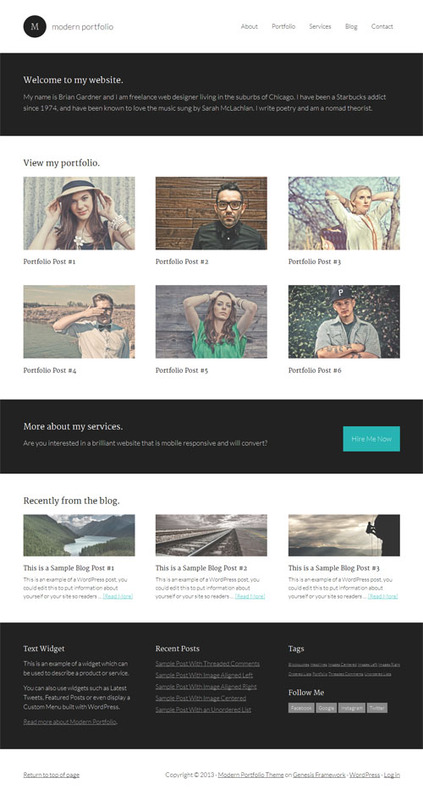 Gallery is a nice photography WordPress theme for the Genesis Framework. The premium child theme from ZigZagPress has a full screen slideshow on the homepage and a menu box which expands when you click the menu icon. It comes with a number of gallery layout options (2, 3 and 4 column and full width), 3 page layouts (left sidebar, right sidebar, no sidebar), a blog section, social profile links, a mobile responsive design, and all the other great features and benefits of the excellent Genesis Framework. Stock Photography is a WordPress theme from Graph Paper Press that allows you to build your own stock photography business website. The feature packed premium theme that lets you to manage your portfolio, blog and have a stock photo business all in the one WordPress powered website. The theme integrates with the free Sell Media plugin which is a complete solution for selling images and other media directly from your website. It allows you to sell any type of media, license media for specific uses, protect file uploads, and accept payments via PayPal. The theme itself has a number of powerful features built-in. It has advanced search functionality, lightboxes for sharing images, image metadata importing, private dashboard area for customers, ability to organize images into collections, social sharing options, various colour options, custom headers, backgrounds, logo, page template options and more. The theme is also mobile ready with a responsive design. O2 is a simple responsive WordPress theme designed for personal sites of creative individuals, portfolio, business and photography websites. The premium theme from Viva Themes has a full screen background slideshow which can have optional captions and as many slides as you like. Other features include: attractive portfolio and blog templates, featured images on posts and pages, custom menus with descriptions, custom shortcodes, text or image logo, full width template and more. Sell Photos is a powerful and mobile ready photography WordPress theme for entrepreneurial creatives. 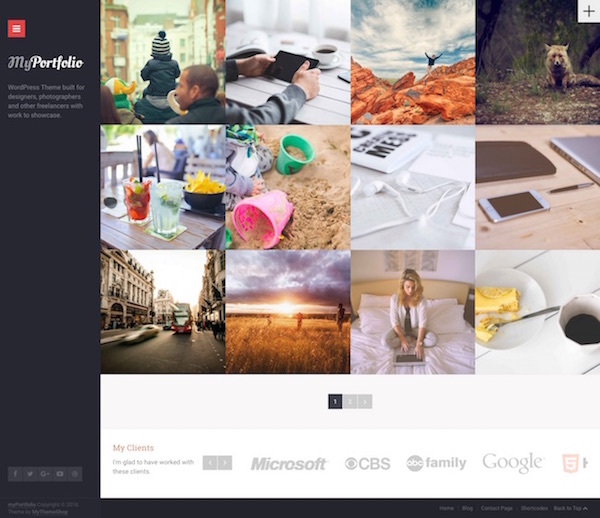 It allows you to manage your portfolio, blog and sell your photos all on your own website. 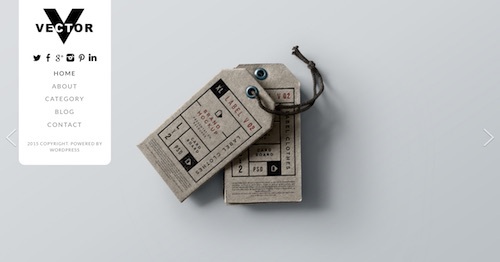 The mobile ready premium theme from Graph Paper Press has a clean and boldly understated design. Some of the other features of the theme include: advanced portfolio management and search functionality, lightboxes for purchasing and sharing images, image metadata importing, private dashboard area for customers, a variety of page templates, blog section, logo and background images, a variety of colour and layout options and more. A professional, minimalist portfolio WordPress theme from Theme Trust. 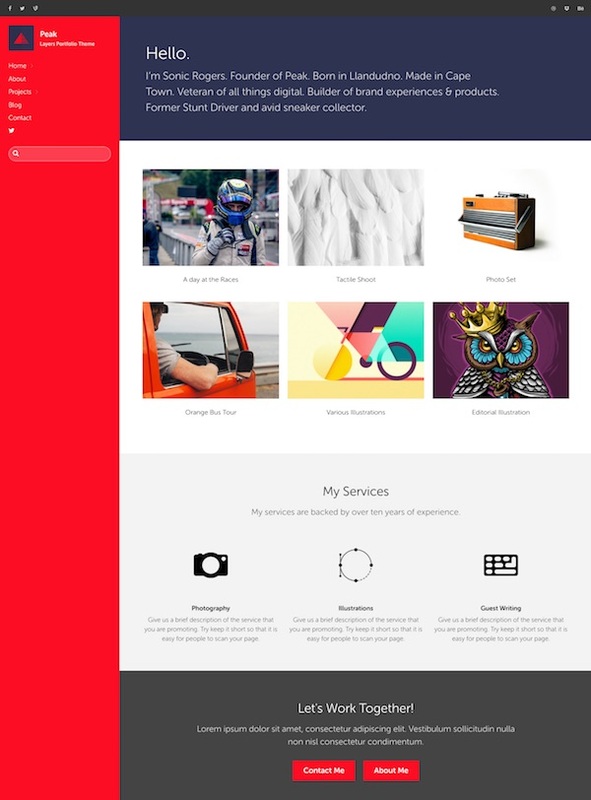 The custom homepage includes a carousel for featured content, and a recent project slider. Other features include custom post types for portfolio management, smooth jQuery effects for thumbnails and menus etc, custom options panel with colour controls to set your own colour schemes and more. 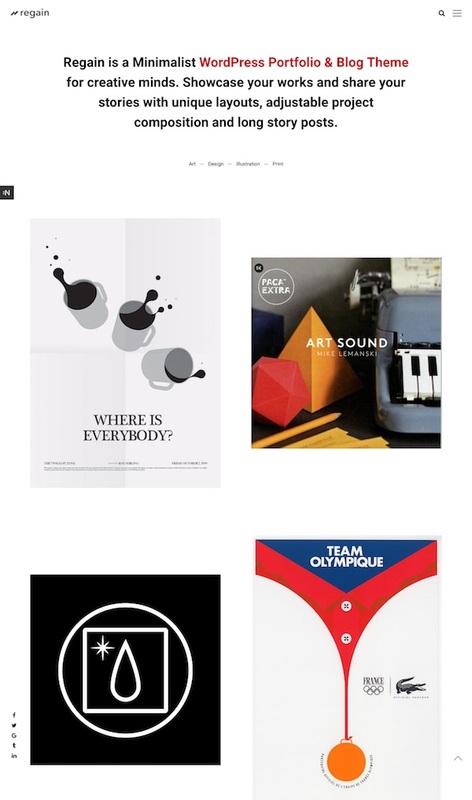 A sleek and professional magazine style portfolio WordPress theme from Graph Paper Press. The theme has a fully responsive design that adapts to all mobile devices beautifully. It integrates with the new Theme Customizer in WordPress 3.4 so you can change colours, fonts, logos, header images, image orientation, left or right sidebars etc and preview your theme customization changes instantly on the page before saving. Other features include slideshows with a simple drag and drop interface, 350 font options, custom widgets and more. Fullscreen is a responsive, photo gallery WordPress theme from Themify that allows you to showcase your photos in a complete fullscreen mode. The theme has a homepage with minimal design elements so your photos are put in centre focus. Users can toggle to fullscreen mode by clicking on the fullscreen button and pressing escape key to exit the fullscreen mode. The fullscreen gallery can be individually assigned to any WordPress Post or Page. It also has a regular gallery with 2 display options: fullscreen swipe or popup lightbox mode. The theme can also be used to display video and multimedia content. A responsive portfolio WordPress theme from Theme Trust. 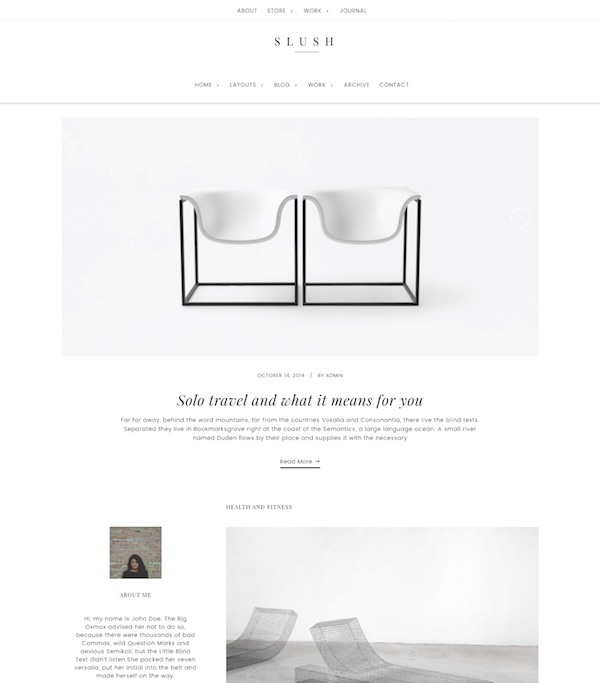 The premium theme has a clean and minimal design ideal for showcasing your work. It features smooth project filtering, Twitter like infinite scrolling for posts, custom post types for portfolios, Google fonts, custom options panel and more. 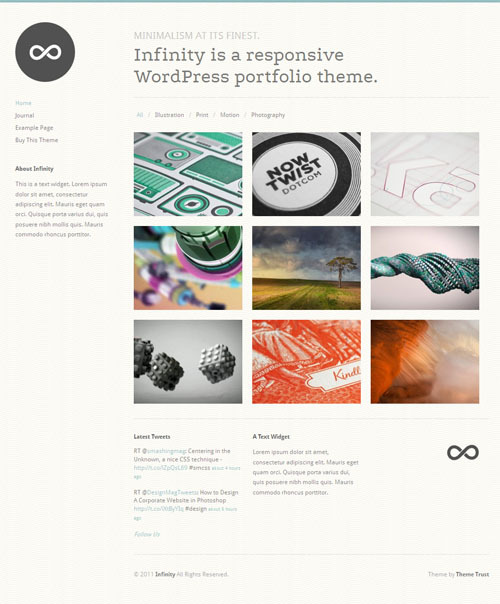 A responsive portfolio WordPress theme from Theme Trust. The premium theme has a clean, minimal style, and the responsive design means it automatically adjusts to look great no matter what the device or screen size it is viewed on. The theme also features an Ajax powered portfolio, masonry or grid layout for portfolio thumbnails, Google fonts integration, shortcodes, custom options panel and more. A beautiful, responsive business portfolio WordPress theme from Theme Trust. The premium theme has a clean, professional design perfect for businesses, design agencies, creative individuals and others. 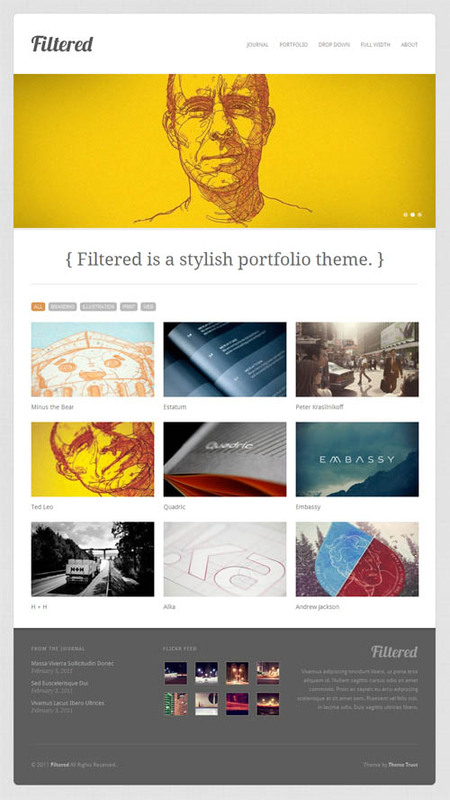 The theme has a unique sequence slideshow on the homepage with options to control text and image position, as well as animation effects. Other features include a filterable portfolio template, Google webfonts, shortcodes, custom options panel and more. The responsive design means it will look great and work perfectly on all devices and screen sizes such as tablets, smart phones and everything else. A professional business portfolio WordPress theme from Theme Trust that lets you easily show off your work, highlight your services, and share your thoughts. The theme has a sleek yet minimal design, and features smooth portfolio filtering animations, masonry or grid layouts, custom post types for portfolio management, a homepage content slider, custom options panel and more. A simple and elegant portfolio WordPress theme from WPZOOM designed for photographers, design agencies, and artists. The theme features 5 different colour scheme options, featured slider on the homepage, portfolio template and custom posts, an advanced options panel and more. 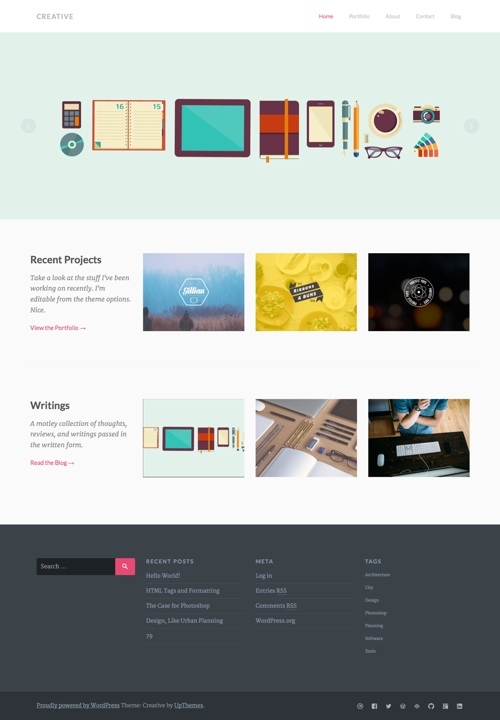 A stylish portfolio premium WordPress theme from Theme Trust. The theme includes a portfolio page template and custom post type for easy portfolio management, thumbnail filtering, WordPress 3.0+ feature support, button shortcodes, and a custom options panel to easily modify the theme to your requirements. 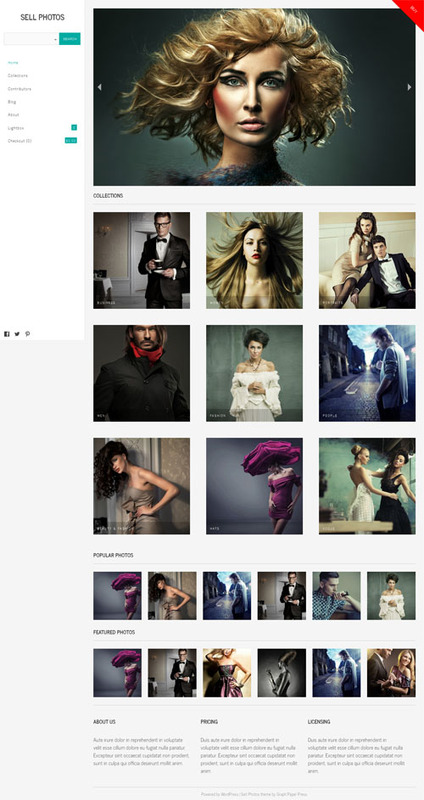 An elegant and professional portfolio / photo gallery WordPress premium theme from ThemeTrust. The theme includes a featured content slider on the homepage, custom options panel, two colour schemes, WordPress 3.0+ custom menus and background, button shortcodes, and multiple page templates allowing you to create 1, 2, 3 or 4 column gallery layouts. 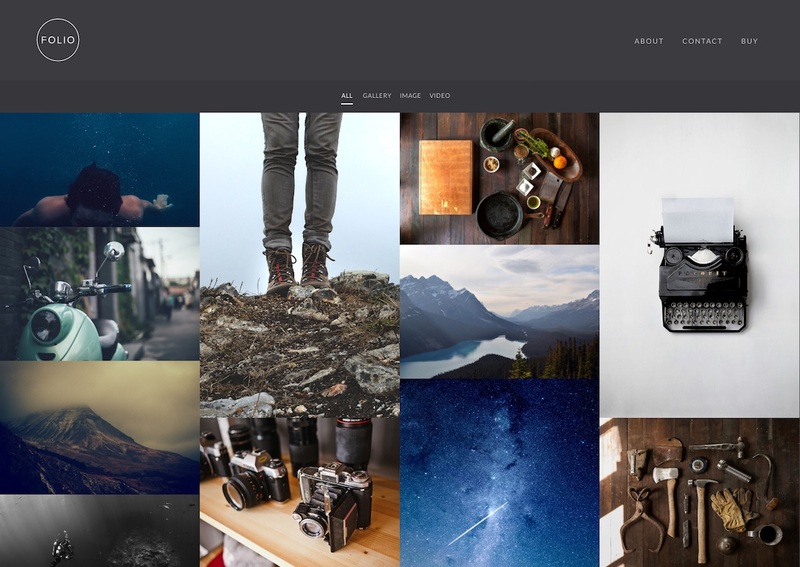 A photography premium WordPress theme designed by photographers for photographers. The theme has 60 different styles straight out-of-the-box, includes a powerful theme options panel, extensive gallery management features and more. A clean and sleek premium WordPress portfolio theme from Theme Trust. The theme has a single page layout with smooth jQuery effects and automatic scrolling and expanding. Features include custom post types for portfolio management, custom options panel with colour controls, portfolio template, custom shortcodes and more. 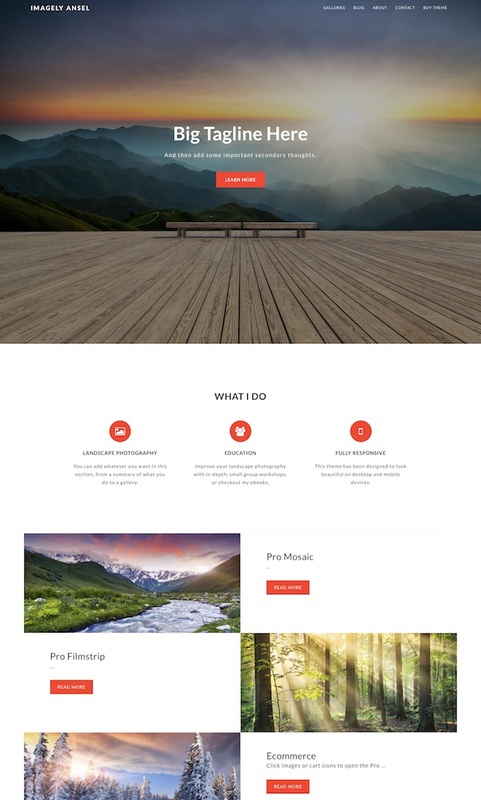 Slide is an elegant minimalist WordPress theme from Themify that allows you to present full screen slideshows. Visitors are able to navigate through all of your posts without loading a new page. The posts are opened elegantly in an animated lightbox window with AJAX, allowing the next or previous post to be viewed in the lightbox without exiting the windows or reloading the page. You can also set the post to open on a regular page. With a simple push of a button the slideshow can be toggled to full screen mode. In addition to the slideshow there are various list and grid layouts available with post filtering options. The theme has a fully responsive design so will work beautifully on all devices from desktop to mobile devices such as iPhone, iPad, Android, and Blackberry. 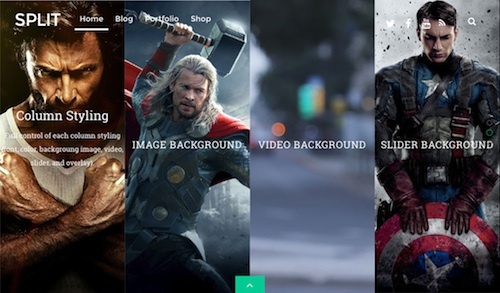 Glare is a slick responsive photography portfolio WordPress theme from cssigniter. The premium theme is ideal for photographers, artists, designers, creatives, fashion houses, models and other wishing to showcase their portfolio is a classy and professional way. Glare has two homepage display options – a super full screen photo slider or a full screen background video. It has a customisable listing and portfolio pages allowing you to select how many columns you want, custom contact page, integrated blog, theme options page, mobile responsive design and more. Mozzy is a beautiful and flexible business / portfolio WordPress theme from cssigniter. The premium theme includes an advanced portfolio section that allows you to showcase your work and products in a variety of formats. The homepage is super flexible so you can select how you want it to display with a slider, set column number and sizes, contact forms etc. It has a fully responsive layout which automatically adjusts to work and look great on a wide range of devices from large monitors to smaller mobile phone displays. The theme is built with the latest and best web design standards – HTML 5 and CSS3. Some of the other notable features include 5 pre made colour styles, custom shortcodes, localization options and a themes options panel that provides only the important options to keep things fast simple. 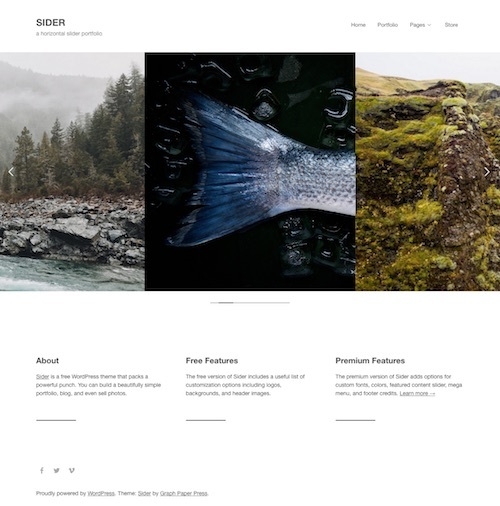 Hardy is a modern, minimalist and responsive portfolio WordPress theme that could also be used for a variety of other purposes including business websites and blogs. The beautiful, modern premium theme from Theme Trust is designed specifically to place your best work right up front by displaying your projects (or other content) in big customisable sections on the homepage. The homepage also has a large full width featured slider, and Ajax load more button to show more sections without needing to reload the page. Some of the other features in the theme include a custom post type for easy portfolio management, integrated blog template, Google webfonts integration, custom shortcodes, and a mobile responsive design. Candela Pro is an attractive creative portfolio WordPress theme for freelancers, artists, agencies, bloggers and others. The premium theme from Design Orbital has a content focused masonry grid like design that allows your content to standout distraction free. It has a modern, clean layout with great typography and could be used to showcase portfolio items or blog posts if used for a content website. Some of the key features of the theme include: retina ready and fully responsive layout, modern hamburger navigation, hidden sidebar and footer sections, post formats and featured images, post list and project list widgets, easy logo uploader, wide or boxed layouts, custom header and background options, Font Awesome icons, unlimited colors, Google fonts, easy options panel, translation ready, and more.